Barcelona's Lionel Messi scores the only goal of the night from the penalty spot before missing another. 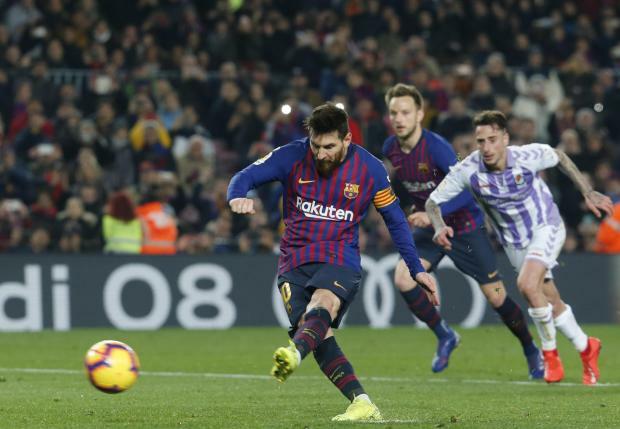 Lionel Messi scored a penalty and missed another as La Liga leaders Barcelona ground out an unconvincing 1-0 win over Real Valladolid. Messi's fitness was again in the spotlight on Saturday after a niggling thigh strain in recent weeks, but he completed the full 90 minutes at the Camp Nou and hit the 30-goal mark at Barcelona for the 11th straight season. The Argentine coolly dispatched a spot-kick just before half-time, drilling beyond the reach of Jordi Masip after Gerard Pique was bundled to the ground by Valladolid midfielder Michel. Masip brilliantly tipped over a Messi volley soon after the interval and Luis Suarez wasted a huge opportunity to double the lead shortly after replacing Kevin-Prince Boateng with an hour gone. Messi found himself booked for dissent after an apparent foul on him went unpunished, and he then blew the chance to kill off Valladolid when Masip kept out his second penalty of the night, awarded following a trip on Philippe Coutinho. The excellent Masip alertly gathered Messi's follow-up header and again denied Suarez late on as Barca pulled seven points clear of Atletico ahead of their trip to Lyon in the Champions League.